If you love beautiful country-style kitchen designs which create a stunning and warming atmosphere for all of the family, then you’ll fall head over heels for Number One Kitchens’ Cornell Oak kitchen design. 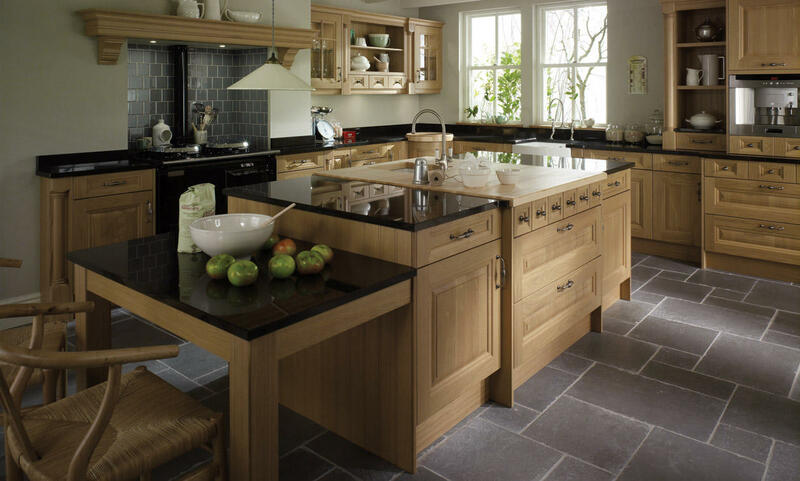 Created with a stunning natural oak, the Cornell Oak traditional wood kitchen is a gorgeous kitchen design, complete with incredible attention to detail that adds a wonderful texture to the wooden look. Including solid timber pilasters, mantels and corbels, as well as having a beautiful country-chic kitchen aesthetic, the Cornell Oak traditional wood kitchen is an incredibly durable and sturdy kitchen solution too. Amazing craftsmanship and incredible design combine to create the Cornell Oak. Finished with vintage-style door handles, the plethora of kitchen cupboards create a multitude of storage opportunities all over the fitted kitchen. There’s also a stunning peninsula as the focal point of the kitchen, providing a surface area for dining, food preparation and entertaining too. It fills the space perfectly and offers a remarkable design element for your kitchen space. The Cornell Oak is pictured here with a glossy black work surface to perfectly contrast the rich golden oak shade of your kitchen cupboards and storage solutions. However, you can choose whichever style kitchen surface meets your tastes. Whether you want a gorgeous contrasting worktop as pictured, or something a little more neutral for a seamless finish, the choice is yours. Not only that, but the Cornell Oak traditional wood kitchen is perfectly customisable, with 27 stunning matte paint shades to choose from to finish off your kitchen to perfection. Finished with a chrome rounded faucet and built in white porcelain sink, the glossy sink feature adds a modern and contemporary twist to your country classic Cornell Oak kitchen. The perfect combination of modern and vintage, the Cornell Oak will create a wonderful kitchen space for your family home.